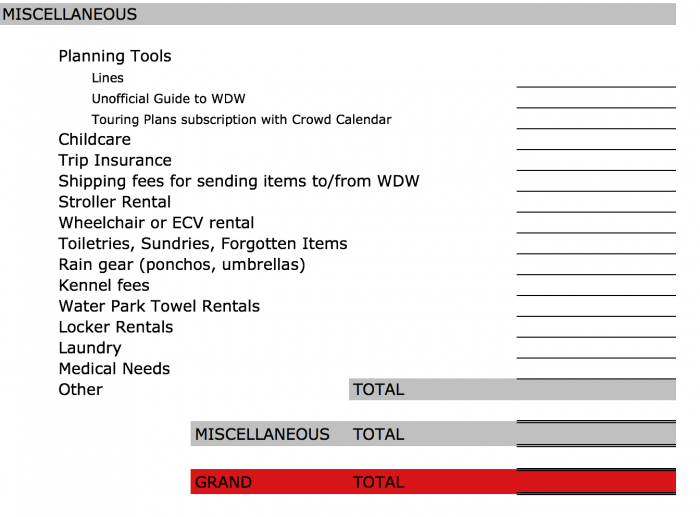 Welcome back to our periodic refresh of the TouringPlans Trip Planning 101 series, where we walk new WDW trip planners through some of the basic components of getting ready for a trip to Walt Disney World. 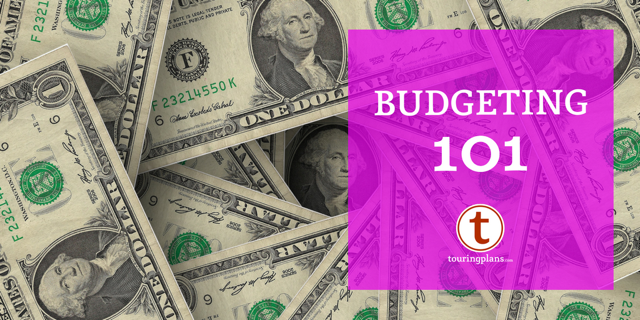 Here we’re looking at factors to consider as you construct the budget for your trip. 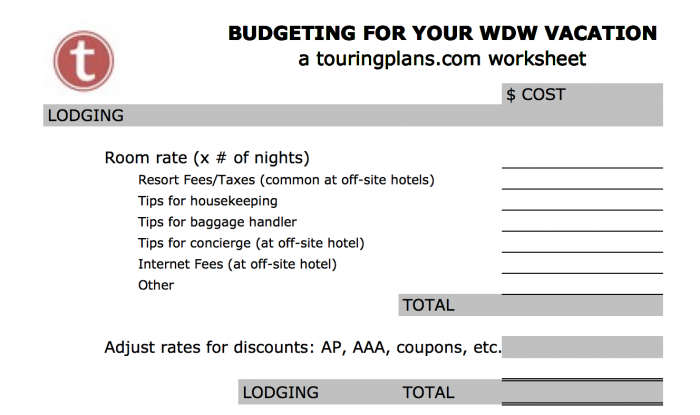 You don’t have to be royalty to budget for a Disney vacation. Before we get started, remember that there are plenty ways to conserve funds and still have a magical vacation. Sure, you can spend a zillion, gamillion, fofillion dollars (technical term) on a Disney vacation, but it’s also possible to have a perfectly lovely trip at a more modest price point, a point which TouringPlans fearless leader Len Testa illustrated particularly well in his blog post comparing the variety of WDW vacation options you can get at various price points. I’m going to walk you through the process of creating a budget for your trip, and suggest some areas of potential savings. What you should know right off the bat is that planning an accurate and economical trip budget is going to involve some math, some research, and possibly some hard decisions. Let’s go through these one by one to see where you can find information on obvious costs and hidden costs, as well as where you can find information on ways to save money. The main get-to-Disney transportation options are flying vs. driving. In some cases, the choice will be clear; if you’re coming from Tampa then you’re driving, if you’re coming from the UK then chances are you’re going to fly (or get very wet). However, for most of the rest of us, the decision may require a bit of calculation. Your ultimate choice must be based on real numbers – not only the cost of plane tickets vs. gas, but also factoring in all related expenses. For example, if you’re flying you’ll want to search your airline website for hidden costs such as baggage fees, seat selection fees, fuel surcharges, or on board snack charges. Fliers should also consider the cost of parking or taking a car service to the airport, tipping for baggage handlers, and other related expenses. Even if you are using frequent flier miles, many of these ancillary charges will apply. You may also want to consider the opportunity cost of using frequent flier miles. Would using your miles for this trip impede your ability to take a more expensive trip later on? Drivers must consider not only the cost of gas, but also meals on the road, wear and tear on the car, pre- or post-trip maintenance, and on-the-road entertainment. Longer drives may even include a night in a hotel along the way, depending on the length of the drive and the number of drivers in your party. For a good rough estimate of gas cost on your trip, try consulting AAA’s Fuel Cost Calculator. Additionally, your fly/drive decision will impact transportation charges once you’re in Orlando. For example, if you’re flying and staying at a Disney resort hotel, you have the option to use Disney’s free Magical Express bus service to get you to your hotel. If you’re flying and staying off site, you’ll need to pay for a car service or rent a car to get to your hotel. If you’re driving and staying off site, you will need to pay for parking at the theme parks (unless you are a Walt Disney World Annual Passholder) and possibly also at your hotel. And remember that now the Disney hotels charge for overnight self-parking, a charge that applies if you’re renting in Orlando or driving your own car to Walt Disney World. When looking at the cost of flying, there are dozens of online tools and apps that can help you locate the most cost effective flight. Popular choices include Kayak, Google Flight, Trip Advisor, Expedia, Orbitz, Priceline, and Travelocity, as well as several others. These tools make it easy to experiment with your flights to find the best deal. Try playing with departure dates or number of connections. Sometimes a Saturday night stay or a brief stopover can save you hundreds of dollars. If you decide to fly to Orlando, many of the sites above also offer discounted rental car opportunities. When renting a car, be sure to check your personal auto insurance policy and your credit card benefits. These often make the purchase of insurance on a rental car redundant. Declining insurance on the rental can also provide big savings. As a starting point, log on to disneyworld.com and get a price for your preferred hotel during your travel dates. This will tell you the standard “rack rate” for the room. You’ll also want to check the room and package special offers page of the Disney website. This highlights the promotions Disney itself is offering. While you’re on the Disney website, it’s certainly worth playing around with your resort choice; even within resort categories there can be significant difference in cost. A little more sleuthing can often uncover discounted prices on the exact same room. On more than one occasion, I have saved about $20 per night at the Pop Century simply by booking through Expedia rather than through Disney directly. I had no loss of Disney benefits–I still got Magical Express service, Extra Magic Hours, and the like, I just paid less for them. If you’re looking for room discounts, try asking a travel agent or using one of the online services listed in the transportation section. Additional discounts might be available for Disney annual passholders or AAA members. The wonderful independent website mousesavers.com is another great source of discount information. You may even want to tinker with the timing of your reservation as a cost variable. Another rule-of-thumb is that if cost is your primary concern, then staying at an off-site hotel may be a big money saver. While this often the case, be aware that some off-site hotels tack on additional fees not represented in the room rate. For example, the non-Disney-owned Swan and Dolphin hotels add a host of incremental charges to your bill. These add-ons can add up fast. Before you settle on an off-site stay, pick up the phone and ask what additional fees you might expect. Again, check Mousesavers.com for listings of hotel discounts or special offers. 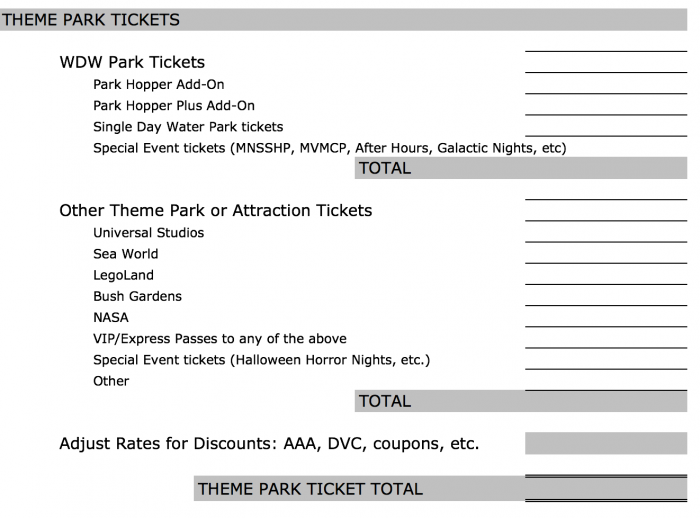 The best place to start for park ticket pricing is the TouringPlans.com Ticket Calculator. The Ticket Calculator makes it easy to play around with variables and see the real price differences between several choices. For example, a few clicks will show you that once you’re visiting for several days, the price of adding another park day has minimal impact on your admission ticket price. 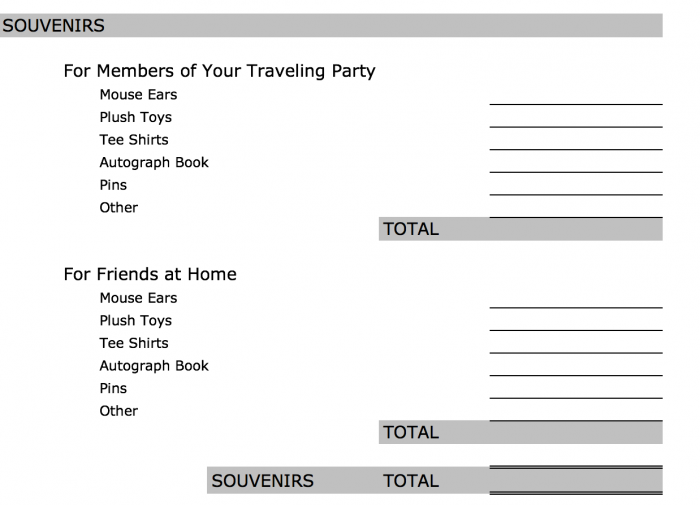 While you’re figuring out how much park tickets will cost, don’t forget to consider the price of the popular evening parties at the Magic Kingdom if you’ll be traveling during the fall or winter. You’ll also want to consider the price of admission to other nearby attractions if you’ll be venturing off campus to see Universal Studios, SeaWorld, LegoLand, or NASA. Another area worth investigating is the purchase of a Disney World annual pass. Annual Passholders are allowed discounts on items including merchandise, some room rates, some tours, some dining, and much more. Depending on your situation, buying an annual pass works as a savings tool, even if you won’t need to fully use it for park admission. 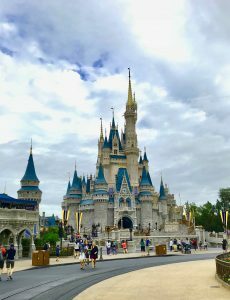 Check out our post, When Does A Walt Disney World Annual Pass Make Sense for more thoughts on this. Planning your food budget takes some serious number crunching. Some Disney guests swear by the Disney Dining Plan (available to guests staying at the Walt Disney World resort hotels), but by no means does the Dining Plan make sense for everyone. To see if the plan is right for you, take a few minutes to look at our detailed menus and pricing for Disney restaurants. Ask yourself some questions and map out a few days of sample eating for your family. Will we eat full breakfast or will a muffin and coffee do? Will we eat dessert with lunch and/or dinner? Can our children share a meal? Do we eat appetizers? … and so on. By really pricing out several days of eating, you can extrapolate your actual food budget needs. If you are a TouringPlans subscriber (and really, you probably should be), you can also access our Dining Calculator, which automates some of these functions for you. Don’t forget to factor in the cost of snacks you bring from home or buy at a local grocery, as well as the price of tips and alcoholic beverages, not all of which are included on the Dining Plan. 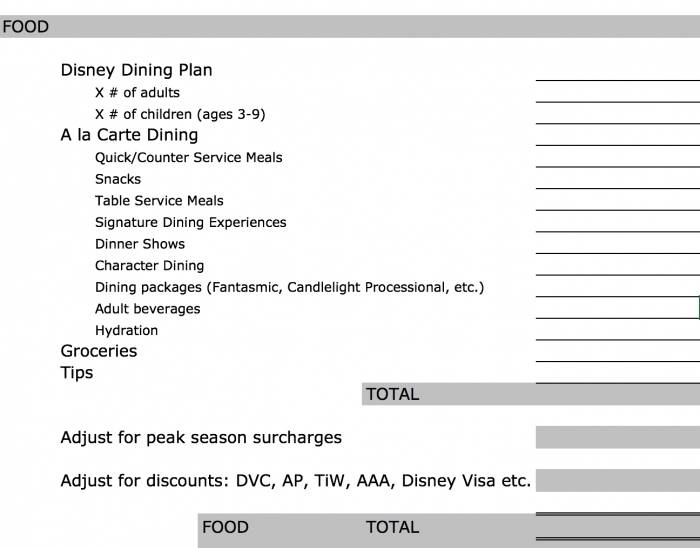 Be aware that many Disney restaurants tack on a surcharge during peak seasons such as the winter holidays. On the cost savings side, many restaurants offer discounts to Disney Vacation Club members, Disney annual passholders, Disney Visa holders, and other affiliations. If you’re an annual passholder or Florida resident, you’re eligible to purchase the Tables in Wonderland discount card, which can be a huge savings for many families. I ALWAYS ask my server what discounts are available. While there is certainly plenty to do at Walt Disney World with just your theme park tickets, there are also many ways to enhance your experience with activities and entertainment. And, no surprise, many of these items cost money. For example, strolling through Disney Springs is free. But then your child sees the oh-so-enticing-and-not-so-free Aerophile balloon and begs for a ride. For my family of five with older children, that 10-minute ride is a $100 proposition. And heck, maybe it’s me that now thinks that Star Wars Secrets of the Empire is a must-do experience. Of course the best way to economize on these activity extras is to simply say “no,” but since you’re on vacation you may want to indulge a bit with a visit to the spa, bowling a few frames at Splitsville, taking a backstage tour, or shooting a round of golf. Pricing for these items is readily available online or with a call to 407-W-DISNEY. Factor them into your budget if you’re planning to partake. The purchase of souvenirs is another area where saying “no” is your greatest budgeting tool. However, as I discussed in a previous post, coming home with absolutely no souvenirs is unrealistic for many families. Keep an eye out for free items at Disney World that can function as souvenirs – stickers passed out by cast members, for example. Or try the tactic of pre-buying items like tees and plush toys at places like Target or dollar stores where prices tend to be lower than in the parks. While you’ll likely not get totally away without souvenirs for your kids, you can often skip souvenirs for friends at home. Does your dog walker really want a Mickey sweatshirt? Do you absolutely have to bring a mug back for your child’s teacher? You may be able to easily trim these items from your budget. This is where everything else settles: stroller rentals, PhotoPass or MemoryMaker purchases, trip insurance, merchandise shipping fees, pet care expenses, special celebration gifts, and so on. 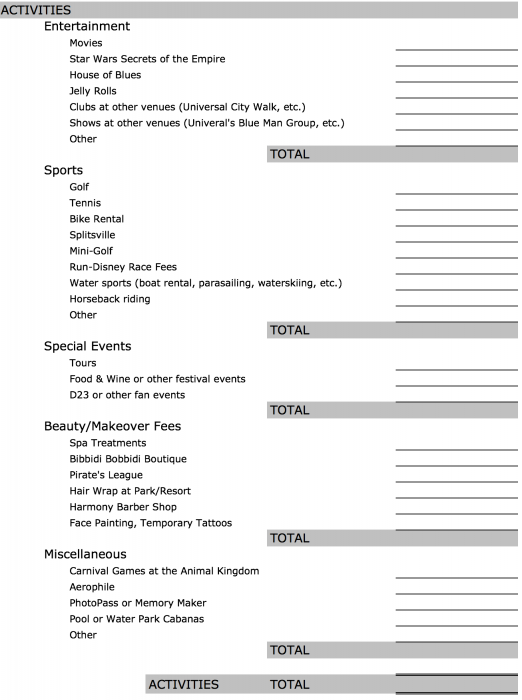 Not all miscellaneous fees will apply to all guests, but chances are there are a few extra costs you may have forgotten. As with nearly everything else in your budget, it pays to shop around for these miscellaneous items. For example, stroller rental prices vary by vendor. You can save money on airline baggage fees by doing some laundry while on vacation, but then you’ll need to factor the cost of washing into you budget. Again, play around with numbers to see what works for you. So what’s your budgeting process? Do you start with tickets? Lodging? Transportation? What do you spend money on that I forgot to include? Let us know in the comments below. ← Is Star Wars: Galactic Nights Worth the Price? I think the best advice in terms of saving money on souvenirs if you have a tight budget is to go to the outlet store near disney springs, we purchased around $300 of merchandise for only $80 and we got four shirts, a hat, sunglasses, 2 pens, a plush, a magnet, a key chain, a large bag great to take to the waterpark, plus a Shanghai Disneyland grand opening pin! I felt like we really got our moneys worth plus it was just great fun! We can drive which is our #1 way to save money. But that does not work for all. If you can drive, staying off site is our #2 way to save money. We don’t have a rental car, but even if you had to rent a car, I would estimate that the cost is 1/2 of the onsite stay cost. I keep track of the cost of all our vacation so I have hard data to back this up. Dining plan is fun, but definitely more expensive. My estimate is that is cost about $1,000 per person for a 5 night stay 4 days in park for on property stays (all kids 10 and up). You can also save money by doing less days in parks. We have gone enough times so that we might only do 2 days in park and hop and 2 days hanging at resort. I would not recommend that for first time travelers or with younger kids. We don’t do souvenirs. The first few times we went, i ordered Disney pin sets off eBay, got them lanyards and we traded in the parks. They might get one other item. You can get Disney stuff about everywhere now, why pay premium in the parks. I saw that there is a section on the budget form for tolls. I think it is very helpful to actually explain just how big of a deal tolls can be, especially those who mercifully do not have to deal with them in their day-to-day lives. Many GPS systems are defaulted to taking toll roads; as such, you may not be paying attention to signs indicating that the highway you are entering is a toll road. You then will be unable to turn off until the next exit, which often itself has a toll gate attached to it. Obviously you can bring rolls of quarters, but it can sometimes cost $9 to go from Central Florida to Cocoa Beach via the 528, depending on your route. That’s a lot of change. Additionally, you *need* to pay close attention to your rental car contract. Some companies only charge ~$4 per day, with a reasonable maximum out-of-pocket per trip. Others, however, charge $8.99 per day of unlimited tolls. Ignore this at your peril, as this particular company will then charge $15 PER TOLL missed. Long story short, toll roads and rental car companies are in a shady business, and you should be keenly aware of what you are getting yourself into. E-Passes and the like can be very helpful. I love pretty much everything about the Touring Plans tools and never plan a trip without them. That said, I found the Dining Calculator to be far too simplistic to be helpful in making food comparisons. 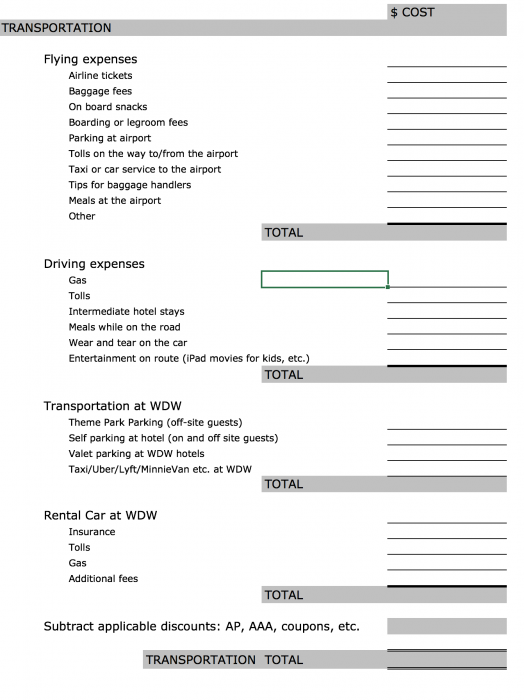 I admit that I haven’t looked at it in a while, so that may be an outdated view, but I have always used the Disney Dining Calculator at https://www.distripplanner.com/ to get an estimate of my food costs. Even if I *know* that the Dining Plan is not where we’re going, I can get a very good estimate using this tool because it allows me not only to specify the restaurants where we are eating, but also to customize by telling it about my family’s eating patterns, for instance that there are 5 of us but we often order only two appetizers and share them. It can be quite a bit of work to put in each restaurant or food service location (there is an option to specify an average value if you don’t have one picked out), but I have found it to be well worth the effort in accurate budgeting.